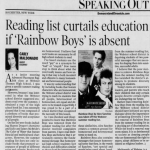 Carly Maldonado is an alumna of Webster Thomas High School and was going into her junior year of high school when the district pulled Rainbow Boys from the high school summer reading list. 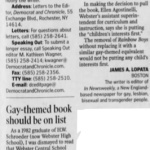 She, like many other Webster residents, was upset over the censorship and wrote an op-ed for the Democrat and Chronicle defending the book and advocating for it’s return to the summer reading list. Sean Welch: Was the issue talked about widely in town/school or kept relatively quiet? 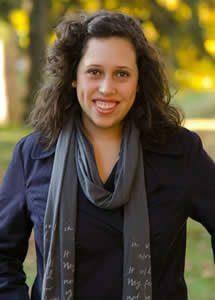 Carly Maldonado: I would say that around town, it was kept relatively quiet. 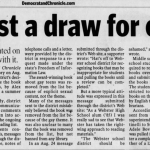 I found out about it from that August 29 article in the Democrat and Chronicle. 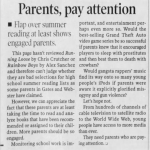 Although school wasn’t actually in session yet when that article was published, I do remember there being some chatter about the incident at the start of the school year. 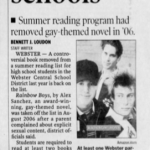 But overall, I very much felt like the district was trying to keep the book’s removal very quiet and would have liked to sweep the entire instance under the rug. SW: Did you have any further role in the challenge or its resolution? CM: After the D&C published my op-ed, I requested an in-person meeting with Adele Bovard, who was the superintendent at the time. As I recall, she would not meet with me herself, but she asked someone else from the district to meet with me. I remember leaving that meeting very frustrated because I felt like the administration was not taking my concerns seriously because I was a teenager. 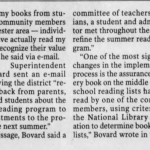 A few weeks later, the district invited me to serve on a committee to review the summer reading program as a whole. Essentially we reviewed the entire summer reading list and made additions (or subtractions – although I don’t remember us actually removing anything unless we determined it wasn’t age-appropriate, i.e. 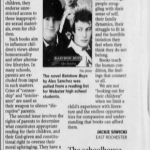 we may have removed books timed at middle schoolers from the high school reading list and vice versa). 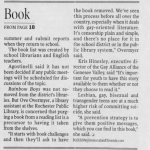 As a committee, we returned Rainbow Boys to the summer reading list. CM: If I knew the name of the parent that led the challenge I would absolutely share it with you. Unfortunately I do not. 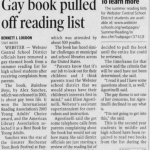 I was never told the parent’s name, but I was told that it was a parent of a middle school student in the district (Rainbow Boys was on the high school summer reading list), and he MIGHT have been a pastor, but that may have been rumor. I am 99% sure that he initiated a challenge at a school board meeting during July or August of 2006. You might actually be able to request the minutes from the school board meetings from those months by submitted a freedom of information request. SW: Is there anyone else you can remember with an active stake in the challenge that you think would be willing to discuss it? Three people come to mind. First is the author Alex Sanchez. Not sure if you’ve reached out to him, but he was very responsive at the time and would probably be willing to comment on it now. The other two are other members of the committee that was assembled after the fact. The first is Carole Barnabas, who is now retired but taught high school English at the time. I don’t have an email address for her, but she is active on Facebook so you could track her down that way. The other is Trish Warren, who was (and I believe still is) the librarian at Thomas. Hope all this info is helpful! It sounds like a cool project! Good luck!